You have the ability accept or refuse treatments and medications in the event you are hospitalized after a mental health crisis. 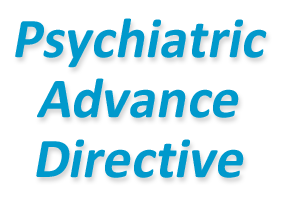 There is a very simple form called a Psychiatric Advance Directive (PAD) that you can complete now, before any potential future hospitalizations. A PAD is a legally binding document that allows you to stipulate treatment, medication and other factors in the event you are hospitalized and deemed incompetent. Completing a PAD, you can list treatments that you refuse such as electro-convulsive therapy or being medicated against your will. By executing a PAD you can direct treatments and medications you either want or do not want. You can also appoint a trusted person as your attorney-in-fact. Your attorney-in-fact can make decisions in your best interest if you are declared incompetent by two doctors. A PAD empowers you to be actively involved in your treatment, especially when you are incapable of making sound decisions. There is no formal approval process and you don’t even need to have it notarized. All you have to do is have your signature witnessed by two adults who will then sign your PAD. Make sure your loved ones know you have a PAD so if you are suddenly hos-pitalized they will know where it is and how to present it to the hospital staff. It is important to note that, in certain conditions, your directives can be over-ridden by a court order. You also have the ability to change your PAD at any time. Executing a PAD can give you peace of mind and helps ensure you are actively involved in your own recovery. http://www.dbsaok.org/wp-content/uploads/2018/07/pad_facebook_png.png 200 281 DBSA Office DBSA Office http://www.dbsaok.org/wp-content/uploads/2017/09/Oklahoma-chapter-logo-high-res-png-1-180x180.png DBSA Office DBSA Office2018-07-14 09:21:352018-07-14 09:34:17Should you have a PAD?